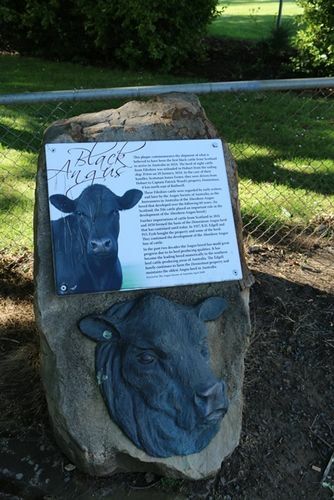 Commemorates the contribution of the Angus Breed of cattle in Tasmania. The Angus breed of beef cattle is the dominant Tasmanian breed which has made a significant contribution to the local economy. Angus breed makes up more than three quarters of the Tasmania beef industry. The first Angas cattle as black polls arrived in Hobart in 1824. The herd then walked to Dennistoun near Bothwell to be the precursors of the herd that is on the property today. This plaque commemorates the shipment of what is believed to have been the first black cattle from Scotland to arrive in Australia in 1824. The herd of eight cattle from Fifeshire was unloaded in Hobart from the sailing ship Troton on 20 Janaury, 1824. In the care of their handler, Scotsman James Foster, they were driven from Hobart to Captain Patrick Wood`s property Dennistoun, 8km north east of Bothwell. Further importations of cattle from Scotland in 1841 and 1858 formed the basis of the Dennistoun Angus herd that has continued until today. In 1917, B. H. Edgell and P. O. Fysh bought the property and some of the herd. They continued the development of the Aberdeen-Angus line of cattle. In the past two decades the Angus breed has made great progress due to its beef producing qualities. It has become the leading breed numerically in the southern beef cattle producing areas of Australia. The Edgell family continues to farm the Dennistoun property and maintains the oldest Angus herd in Australia.